Going on a road trip? Preparation and staying safe on the roads go hand in hand to ensure you have a fantastic time on your summer adventure. Whether it’s Route 66 or a trip down to Cornwall, all you need is great music, great scenery, and even better company, right? But to make the journey go as smoothly as possible, you need to know you’re in safe hands. That’s where your smartphone comes in. Plan your trip on the computer first Everything You Need to Prepare for a Long Car Journey or Road Trip Everything You Need to Prepare for a Long Car Journey or Road Trip I love road trips. Just saying or writing this word sends shivers of excitement down my spine. 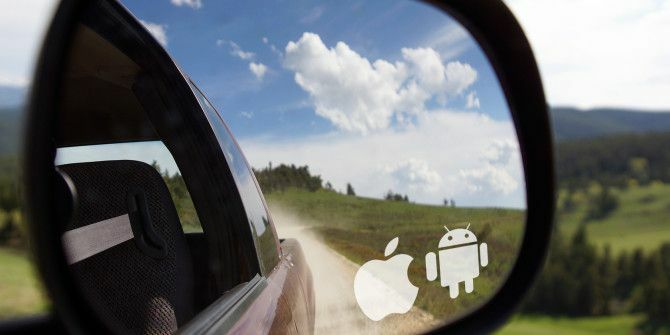 If you think I’m crazy, it’s probably because you grew up in a country where road trips are... Read More , certainly, but your phone can also keep you worry-free on your relaxing break if you have these apps. Voted Best Overall Mobile App at the 2013 Mobile World Congress in Barcelona, Waze (Free on iOS and Android) is basically your own mini satnav without the expense. The difference is, you have a community of travellers to help you along the way. Other drivers share traffic reports on the app, so you can avoid jams and accidents, plus it alerts you when you’re coming up to a speed camera. You can also track the progress of your friends to a particular destination when you connect via Facebook, and if you’re running low on petrol, Waze will guide you to the nearest and cheapest garage. There are downsides, of course, including that old GPS annoyance: routes that don’t go straight from A to B, but “round the houses” instead. It’s reportedly gotten worse since being acquired by Google last year. Depending on your viewpoint, the fact that Waze spots speed cameras is both good and bad. It means people can still get away with driving like idiots, safe in the knowledge that a normal camera won’t snap them (though a mobile unit might!). Nonetheless, it’s good to be aware of them, especially as they might make you think about how fast you’re really going. Furthermore, many speed cameras in Britain have been turned off, and Waze can’t tell the difference between those and the ones that might catch you. Naturally, it all depends who your insurer is, but it’s worth checking exactly which companies have an app for roadside assistance. The AA is generally considered to have a good quality service and app; their Android and iOS versions include services for non-members (like reminders to store information about your car) and members alike, although naturally, more is available for the latter. Most useful is the ability to log breakdowns and track where the rescue vehicle is without calling the company. That’s not available to all members yet, but the scheme is being extended. The RAC also offers apps for your Android and iOS devices [No longer available]; it features similar sorts of things — traffic news, route planners, and the ability to request a quote — but doesn’t allow you to log a breakdown without calling them. Even car companies offer roadside assistance apps, including Lexus (for iOS [No longer available], hitchhiking on the back of the AA Roadwatch maps) and Toyota (for iOS [No longer available] and Android [No longer available]), valid for those under their care plan, and including ETA of rescue vehicles. If you want a really safe, relaxing, and enjoyable journey, it’s definitely advisable to take regular breaks. This might even mean a stay over at a hotel or inn, offering you the chance to explore the surrounding area. Or it might just mean you get a drink and visit the toilet! A good idea is to set your alarm clock or reminder up at intervals throughout your planned trip (you could use location-based reminders How to Set Up Location Alerts in iPhone Reminders How to Set Up Location Alerts in iPhone Reminders Set location-based alerts using the iOS Reminders app and never forget to buy bread or pick up a package ever again. Read More for this) so you can look out for service stations. Depending on where you are, there are several apps that map out nearby stops: Rest Area Locator for Android [No longer available], or Rest Area Finder for iOS are free for anyone in the US. Alternatively, there are more localised apps, like RAA Rest Stop Locator for South Australia. You may just need the bathroom, in which case Toilet Finder (for Android and iOS) is ideal. It works on the same basis as Waze in that a community of peers add in new WCs or advise of the ones that aren’t there anymore. It boasts some 60,000 toilets and details whether they’re free to use and if there’s disabled access. However, it doesn’t tell you in which organisation the toilets are located — and if you need to buy something to use them! Perhaps it’s just a change of scenery you need: a nice walk in the park would do, right? My Parx (available for iOS [No longer available] and Android [No longer available]) covers a wide range of places, including the US, Australia, Mexico, and New Zealand. It’s constantly expanding, and developer Two Bulls works with park authorities to deliver up-to-date info. What’s more, it includes some stunning photos, and you don’t really need Internet access as you can download details of the parks for offline use. Admittedly, there are huge gaps when it comes to the places it covers. The nearest park to me, for instance, is apparently over 90km away, and the one after that is a whole ocean away: Central Park in New York! This all goes hand in hand with taking normal precautions. Don’t drive and use your phone. If you need to text, stop your car in a safe place; you could still use Siri or these 4 apps for Android Don't Text & Drive! 4+ Apps To Keep You Safe On The Road [Android] Don't Text & Drive! 4+ Apps To Keep You Safe On The Road [Android] Using a mobile phone while driving is dangerous. We all know that. This danger is the one thing the smartness of our phones doesn’t really solve – no matter how smart they get, they still... Read More . Relax and enjoy your well-deserved break.